DOING used plastic recycling plant which adopted advanced technique and machine design can split waste tyres & plastic & rubber into black plastic fuel oil (after catalytic pyrolysis will get high quality diesel). Black plastic fuel oil rate is about 45%-90%. 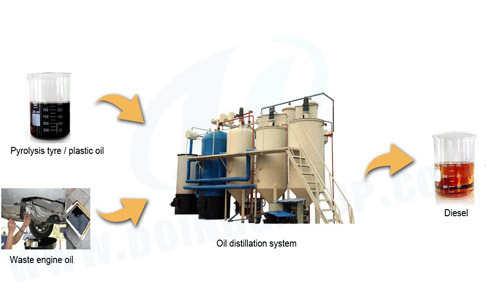 And diesel oil recovery rate can be 85%- 90% with used plastic to diesel fuel plant. Our latest technology for recycling used plastic to diesel fuel, also named waste oil distillation plant can recycle black plastic oil into 85% non-standard diesel fuel and the remaining is asphalt. How to recycle black plastic oil into diesel fuel? First, to pump black plastic fuel oil into distillation diesel fuel plant. Second, we need to heat black plastic fuel oil and keep it in a best temperature for best diesel quality. Fuel oil will be converted to diesel oil gas when get heating.Then our cooling system will cool diesel fuel oil gas into diesel fuel. Next pump diesel fuel oil into odor and color removal system for remove which will purify further diesel fuel with special catalyst. Finally, you can get 85% diesel from our black plastic oil to diesel fuel plant. 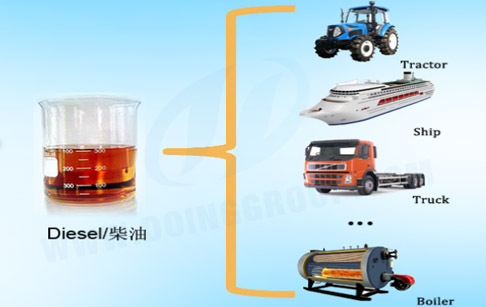 Diesel fuel got from used plastic to diesel fuel plant can be used in the dieselengines found in most freight trucks, trains, buses, boats, and farm andconstruction vehicles. Some cars and small trucks also have diesel engines.Diesel fuel is used in diesel engine generators to generate electricity. Mostremote villages and other locations, use diesel generators to supplyelectricity. Many industrial facilities, large buildings, institutionalfacilities, hospitals, and electric utilities also have diesel generators forbackup and emergency power supply. If you wanna to get more details about Used plastic to diesel fuel plant you can send E-mail to market@doinggroup.com. You can consult our professional engineer and specialized sales team with leave a message in below form.We will contact with you ASAP.You also can visit our factory in Henan,China.Get Detailed address.